If you're looking for Christmas cocktails, snow in Florida and Menorah lightings, this weekend is for you. Snow in Florida. Giant Menorah lightings. Holiday decor made out of thousands of Lego bricks. The holidays are in full swing in Tampa Bay. Here are 10 ways to celebrate this weekend. About 65 tons of snow is shipped in to make a play area in North Straub Park for Snowfest. There are also toboggan slides, karaoke, inflatables, a playground, video gaming stations and plenty of changes to enjoy the cold stuff. Food trucks will be on hand for goodies. 10 a.m. to 3 p.m. Saturday, Fifth Avenue NE and Bayshore Drive, St. Petersburg. Tampa kicks off the holiday season on Friday with the 8th Annual Tree Lighting, the Santa Fest and the annual Christmas Parade. Festivities begin at 6 p.m. with sing-a-long holiday carols, then the tree gets lit at 7:20 p.m. by Mayor Bob Buckhorn and his family. After the tree lighting, the movie 'The Santa Clause' will play on the big screen. On Saturday, the Santa Fest and Christmas Parade will roll through downtown Tampa beginning at 11 a.m. It’s planned to be the city’s largest Christmas Parade with 80 floats tossing beads, candy, and more goodies. The city of Tampa said the best viewing area is along Madison Street from Pierce Street to Tampa Street. Parade goers are advised to arrive by 9 a.m. to avoid traffic and road closures. The 37th Annual Santa Fest includes free photos with Santa, holiday entertainment, games, bounce houses, a rock wall, and crafts. 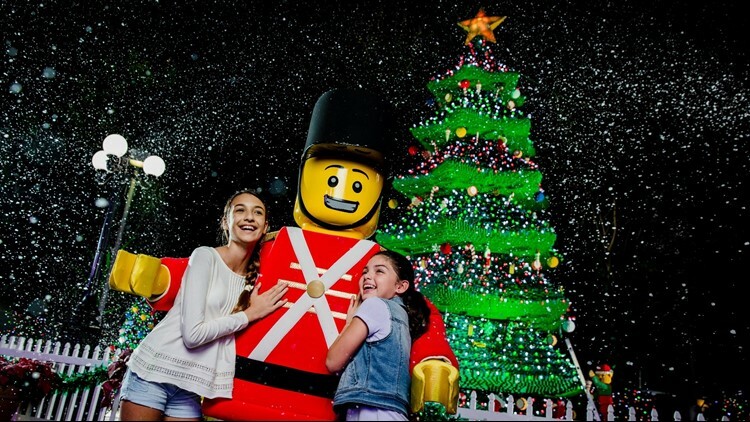 It runs until 4 p.m.
Legoland Florida’s annual Christmas festivities kick off this weekend with shows and treats, lights and holiday-themed Lego displays. Some of the highlights include a 30-foot Lego Christmas tree and meet-and-greets with life-sized Minifig toy soldiers and Santa Claus. There are also giant Lego wreaths, Santa’s sleigh and reindeer made out of thousands of bricks. Christmas Bricktacular is included with park admission, starting at $94.99. The event runs weekends through Dec. 16 and Dec. 22-31. The first “Miracle” bar popped up in 2014 in New York City, but grew to 50 locations nationwide last year. This year, there are 90 places worldwide where patrons can sip holiday cocktails and bask in kitschy holiday decor. It’s an Instagrammer’s holiday paradise. And, two bars in Tampa Bay got the Miracle makeover -- Intermezzo Coffee & Cocktails in St. Petersburg and MeLang - Pangea Alchemy Lab in Sarasota. The pop-up bars have a dozen different holiday cocktails like the Christmaspolitan, the Bad Santa, Run Run Rudolph, and Jingle Balls Nog. Miracle bars are open through New Year’s Eve. Make-A-Wish South Florida hosts a Christmas event with food and festive activities. Proceeds will go to help grant wishes for critically-ill children. Kids can walk down Candy Cane Lane to meet Santa, have their faces painted and decorate cookies and gingerbread houses. More than 30 local families are also expected to attend with former “wish kids” volunteering in Candy Land. The event will run from 11 a.m. to 1 p.m. Sat. on Michael’s on East, located at 1212 S East Ave., Sarasota. The annual Jewish Festival of Lights kicks off this weekend, and there are plenty of latkes, doughnuts and Menorah lightings to be had around Tampa Bay. Bring your four-legged, furry family members to meet the big man himself on Sunday at Westfield Countryside mall. If you don’t have pets, it’s still an opportunity to see a bunch of good boys and girls dressed up to meet Santa. Santa’s Holiday Sleigh is on the lower level near the Cobb movie theater and will be available from 6:30-8 p.m. Sunday, 27001 US Highway 19 N, Clearwater. Skip the line and reserve a spot here. ZooTampa celebrates their Christmas baby, Holly Berry the Pygmy hippo, turning one year old. She’ll get special enrichment and treats on Saturday and party guests will get to enjoy special ice pops from The Hyppo Tampa. Holly Berry was born last year at the zoo weighing just nine pounds. Her name came through a competition in partnership with The Hyppo Gourmet Ice Pops. The party is included with park admission from 11 a.m. to 12 p.m., 1101 W Slight Ave., Tampa. Clearwater’s Winter Wonderland has been an annual event since 1993 with proceeds that benefit children in Pinellas County. The event is a complete Christmas village with thousands of lights and displays, photos with Santa, cookie decorating, a hot chocolate shop, a petting zoo, pony rides, a playground, and the Holiday Express Train. Entrance to the village is free, but attendees are asked to bring a non-perishable donation or unwrapped toy. Donations are given to local charities like the Homeless Emergency Project. The grand opening of Winter Wonderland is 6-9 p.m. Sunday and runs 6-9 p.m. Wednesdays through Sundays through Dec. 22. More than 500 different styles of the Nativity are on display at St. Clement Catholic Church in Plant City. The displays are from different periods in history and all kinds of styles from clean and simple to bright and colorful. The Diocese of St. Petersburg said the displays belong to Father Henry Riffle, a retired priest, with a passion for collecting these displays of the birth of Jesus. The scene displays open Saturday and run through Jan. 7. The displays are open after Saturday and Sunday Masses and Sundays from 2 p.m. to 5 p.m. at 1104 N Alexander St., Plant City.